We're for the Heroes. Queensland Police Credit Union (QPCU) Launched Their New Brand Campaign Today, Created by Blue Pencil Advertising. Sydney, Australia, April 03, 2014 --(PR.com)-- Queensland Police Credit Union (QPCU) launched their new brand campaign today. Created by Blue Pencil Advertising, the agency was commissioned by QPCU to refresh the brand inline with its new corporate vision, mission and value statements. 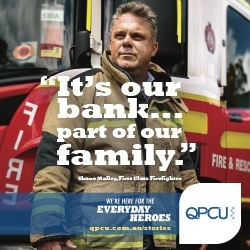 At the heart of the new brand campaign is the idea that QPCU is there for the everyday heroes. James McDonald, Director at Blue Pencil said, “This new brand campaign sits at the core of everything QPCU does. It’s why they’re different to banks and other credit unions and it underpins what they do and why they do it. The campaign is supported by the attached Adshels. Imagine the love child of IBM and an Ad Agency. That’s Blue Pencil Advertising. Combining the best of a communications agency with a team of digital and data nerds, we deliver intelligent marketing solutions. Our work is focused on finding more effective and measurable outcomes for our clients, through originality in technology, creative, media and data. With offices in Brisbane and Sydney, the agency is privately held and was founded in April 2013 by Directors Tom Evans and James McDonald.